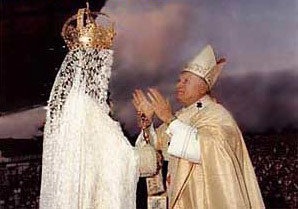 Ask just about any Roman Catholic apologist if Catholics pray to saints or the pictures, medals, statues, etc., that bear their likeness and the answer you are most likely to receive will be a resounding, "No!" Forget the fact that Catholic Mary is a saint, Queen of Heaven and Earth, Co-Redeemer, Mediatrix, Advocate and Dispenser of God's Grace, she is still a saint. Forget all the countless books, booklets, leaflets and cards that bear words to use when invoking the aid/intervention of some one of the thousands of demigods who make up the pantheon of Catholic saints. Forget the millions of offertory candles burning before the images of Mary, Michael, Anthony of Porras, Judas Thaddeus, and the like. Forget all the sightings of men, women and children kneeling before such an image with heads bowed, hands clasped in prayerful attitude, as they fervently mouth heartfelt pleadings or tender sincere thanks to the spirit of the person the image represents. Catholics do not pray to saints. Forget the two "miracles" attributed to one of Roman Catholicism's fast-track candidates for sainthood. As reported in today's newspaper, both so-called miracles were the result of prayers to the spirit of the not-so-long- dead candidate. "PHILADELPHIA – When doctors first diagnosed 1-year-old Amy Wall with incurable nerve deafness several years ago, her parents prayed that their baby might someday learn sign language. "But Amy's 7-year-old brother, Jack, believed in miracles. He wanted Amy to hear. And he demanded they pray for a cure. "So the Bucks County, Pa., family prayed to the late Mother Katharine Drexel, a Roman Catholic nun from Philadelphia who devoted her life to the poor. Months later, Amy was not only hearing – but speaking. Okay, that's the second of the two required miracles. So what was the first miracle attributed to Drexel? Why, it was another deafness cure. Ephesians 6:18-19, "Praying always with all prayer and supplication in the Spirit, and watching thereunto with all perseverance and supplication for all saints; And for me, that utterance may be given unto me, that I may open my mouth boldly, to make known the mystery of the gospel,"
The difference between intercessory prayer such as the kind I offer (biblical) and Catholic intercessory prayer (non-biblical) has to do with to whom the prayers are offered. When I pray, I pray only to God Almighty for, as a blood-bought child of God, I can go boldly into His presence. And when I do so, my High Priest stands with me. Hebrews 4:14-16, "Seeing then that we have a great high priest, that is passed into the heavens, Jesus the Son of God, let us hold fast our profession. For we have not an high priest which cannot be touched with the feeling of our infirmities; but was in all points tempted like as we are, yet without sin. Let us therefore come boldly unto the throne of grace, that we may obtain mercy, and find grace to help in time of need." When a Catholic prays, more likely than not, he will pray to Catholic Mary or the spirit of some other dead person Catholics call saints. In those prayers, they may ask the recipient to intercede for them before the throne of their supreme god, or goddess, as the case may be. More likely, they will ask that spirit to heal them, help them to find something that is lost, freshen a dry cow, etc. Those are prayers to a spirit, not to God, and that does not please the real God, the God of Scripture. Deuteronomy 18:9-12, "When thou art come into the land which the LORD thy God giveth thee, thou shalt not learn to do after the abominations of those nations. There shall not be found among you any one that maketh his son or his daughter to pass through the fire, or that useth divination, or an observer of times, or an enchanter, or a witch, Or a charmer, or a consulter with familiar spirits, or a wizard, or a necromancer. For all that do these things are an abomination unto the LORD: and because of these abominations the LORD thy God doth drive them out from before thee." Looks to me like the families of Amy and Robert sure prayed to someone other than God. When they prayed they weren't even praying to one of the demigods Catholics call saints. Not much difference between Catholic offering of prayers to the ordinary spirit of dead Katharine Drexel and what we see New Age channelers, gypsy "mediums" or itinerant media faith healers doing. All are invoking powers not of God, despite their claims, and this is is something Almighty God has clearly told us is a no-no. Need help with your prayers? God knows that all His children have needs, some of which they may not even be aware of. Being a loving and nurturing Father to His children, He provides that help in the form of a divine Intercessor. Romans 8:26, "Likewise the Spirit also helpeth our infirmities: for we know not what we should pray for as we ought: but the Spirit itself maketh intercession for us with groanings which cannot be uttered." In other words, every Christian has God the Holy Spirit as his "prayer partner." Seems to me that is about as good as it gets, as far as our needs are concerned. And when we pray for others, we direct those pleadings not to some pale spirit but to Almighty God Himself. Catholics, please put down your Catechism and pick up your Bible. WARNING: The Catholic Church is a Big Hoax!